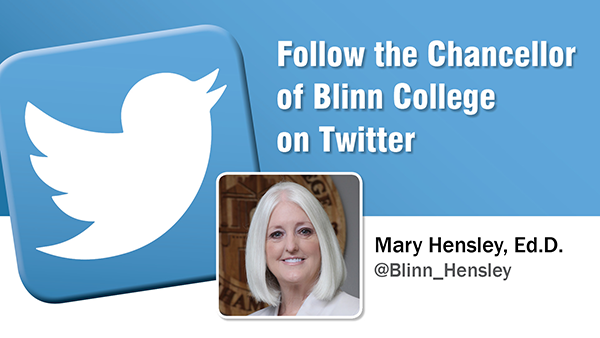 Under the leadership of Mary Hensley, Ed.D., the Blinn College District has established itself as a community college district at the forefront of student-centered programming and innovative partnerships. leading Blinn’s partnership with The Texas A&M University System at the RELLIS Campus, making Blinn part of a new educational community that will combine a major university system and a community college at a single physical location. overseeing development of the Kruse Center on the Brenham Campus and the development of a new student housing facility on the Brenham Campus that will allow an additional 465 students to attend Blinn each semester. refining the College’s division structure to equalize contact hours between divisions, address the workload of department heads, and provide operational efficiency. continuing Blinn’s reputation for academic excellence. According to the Texas Higher Education Coordinating Board, Blinn’s academic transfer rate of 36.9 percent ranks second in the state and far exceeds the state average of 20.9 percent. ensuring that Blinn remains affordable to students. According to figures compiled by the Texas Higher Education Coordinating Board’s CollegeForAllTexans.com, Blinn students taking 30 credit hours during the 2018-19 academic year will save $3,914, or 42 percent, compared to state residents at the average Texas public university. introducing Texas A&M Engineering Academy at Blinn-Brenham, a living and learning community where talented students can pursue their engineering degree while co-enrolled at Texas A&M and Blinn. With Engineering Academies located on the Brenham and RELLIS campuses, approximately 500 Blinn students participate in this cutting-edge partnership each year.